"Anti-doping rules and Athletes' rights"
EU Athletes and Uni Europa Sport jointly organize a theme conference for player association representatives on anti-doping at the Council of Europe building in Strasbourg, France. 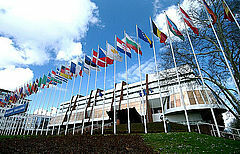 The three day conference features exchanges on anti-doping developments in the participants countries and sports, discussion and presentations on the next stages of the WADA Code revision process, as well as exchange with government representatives and ADOs at the Council of Europe Monitoring Group on the Anti-Doping Convention, which is holding its meeting during the same days. The conference also aims at developing information materials on anti-doping for elite athletes.